There are quite a few insulated hammocks on the market now and that means more competition and more options, which I think will continue to help this segment to mature. I’ve had the pleasure to test a prototype of the Superior Hammock over the past few weeks and I’ve been reluctant to finish because I’ve really enjoyed sleeping in it! 10/26 Note: Superior Hammock is currently being funded on Kickstarter. The Superior Hammock Ultimate Sleep System is an open, gathered-end style hammock with an integrated, sewn-in, full-size under quilt attached. The full kit includes a top quilt, bug netting, rain fly, and suspension. 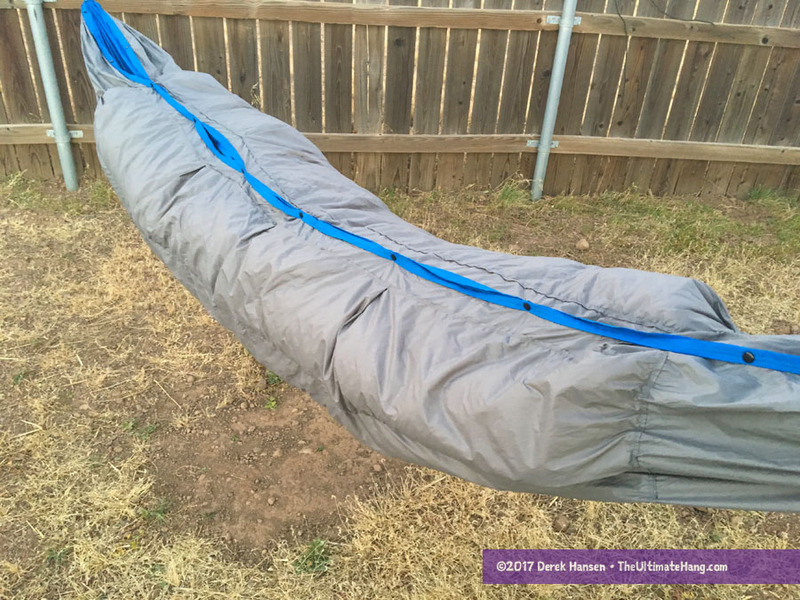 In this review, I’m only focusing on the insulated hammock and top quilt. While the insulated hammock itself has many unique features, I want to call out it’s dimensions. The manufacturer measures the hammock at 10.25 × 4.8 ft, which seems slightly narrow than most double hammocks. However, the slightly narrow width is actually perfect for the length because there is so little, if any, wasted fabric along the sides when laying diagonally. No fabric flops in my face. The dimensions are just about perfect in my testing, and the lay is extremely comfortable when hung around 30-degrees and laying on a diagonal. The insulated hammock uses longitudinal baffles, which helps prevent down from shifting to the bottom of the chamber. Along each side of the hammock are a number of plastic snaps that can fully enclose the hammock into a pea-pod (or what I affectionally call the “pickle”) style, like you would see when pulling a sleeping bag over a hammock. While not everyone likes peapod style insulation, it can come in handy in extreme cold conditions when you want to minimize dead air space to maximize calorie-to-BTU transfer. The hammock itself is extremely comfortable. The fabric uses two layers of 1.0 HyperD and the top layer of 1.6 HyperD in a single panel design. The hammock is essentially double layered, since the under quilt is sewn to a separate layer that is attached along the perimeter. There is no access between the layers. The full-length under quilt makes sleeping a dream because I don’t have to worry about my under quilt sliding off in the night or worrying about quilt hooks and suspension. Matched with the insulated hammock is a top quilt. The design I was sent was a prototype, but the essential components were there, including a double-layered insulated foot box. The foot box is extremely puffy and warm, and it makes my other top quilts a little envious. I wish they all had the thick foot box. Those who buy down booties to keep their feet warm will want to take a look at this top quilt. The final design includes matching snaps to pair with the hammock, if you want, or can be tucked up close to you. I’ve been slowly warming up to insulated hammocks over the years as they provide a level of simplicity to hammock camping, both indoors and out. The Superior Insulated Hammock has a lot of well-crafted and thoughtful design options that are appealing. The hammock is generously sized and very comfortable. Suspension and Anchor System ♥ ♥ ♥ ♥ ♥ The hammock comes with high-quality wiregate carabiners, Dyneema suspension, and straps. Construction and Craftsmanship ♥ ♥ ♥ ♥ ♥ Excellent craftsmanship; straight, even stitching; reinforced; quality materials. Aesthetics ♥ ♥ ♥ ♥ ♥ The color combinations are nice, but I’m not sure what options will be available in the final version. Price and Value ♥ ♥ ♥ ♥ ♥ Hand-crafted, cottage vendor with high standards, comparable to purchasing quilt and hammock separately.